It's one of the most common questions about electric cars: What happens to the battery packs after the car is junked? Do they just get thrown away? Will any of them be recycled? What happens to their components? The answer is electric-car batteries will largely be recycled--but that they will have a second life after they're taken out of the car they were supplied in. Even after the pack can only store 70 percent of its original energy capacity--the point at which it's considered no longer usable in a car--it remains a perfectly viable energy storage device for other types of uses. Speculating on those uses inspires both entrepreneurs and utility executives, not to mention the business development people at carmakers themselves. And today, we have two examples of second-life reuse of battery packs from General Motors and Nissan, both of whom are among the top three plug-in electric car makers in the world. 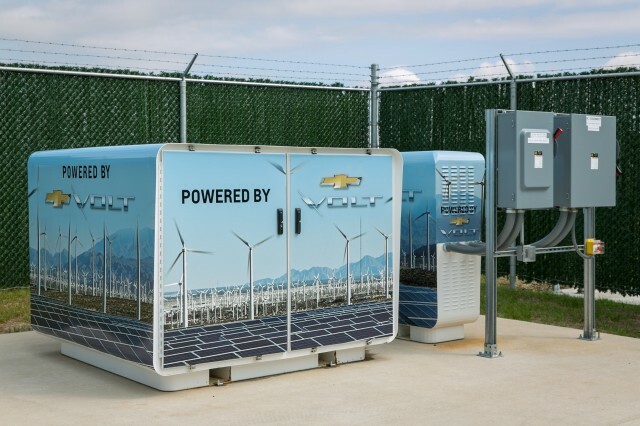 Five battery packs taken from used Chevrolet Volts are already providing electricity to help keep the lights on at GM's new Enterprise Data Center at its Milford Proving Ground in Michigan. GM released that news this morning, including some photos of the installation--complete with snazzy Volt graphics on its housing. Two 2-kilowatt wind turbines and a new 74-kW solar array send energy to the building, producing a total of 100 megawatt-hours of energy a year, enough to supply energy for the office building and the lights in the adjacent parking lot. The five Volt batteries, wired in parallel, can also supply the building for up to four hours in the case of a power outage or other emergency. GM says the building uses net zero energy on an annual basis (though we presume it is grid-tied for cold, grey Michigan winters). Meanwhile, Nissan announced yesterday that it had joined forces with Green Charge Networks to deploy used lithium-ion battery packs from its electric cars for stationary energy storage both in the U.S. and internationally. 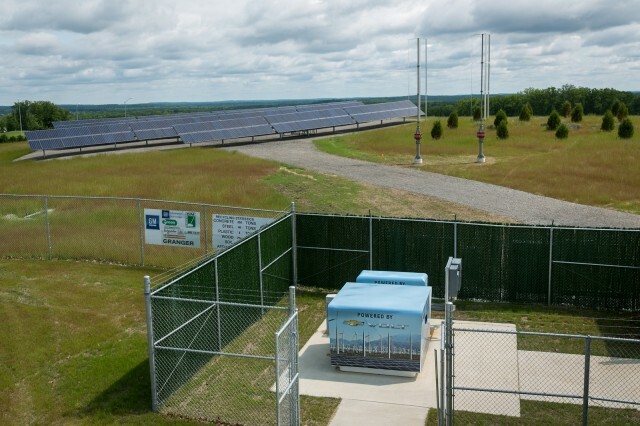 Green Charge Networks, the largest provider of commercial energy storage, will install and manage the energy storage unit. The companies say these units will offer a cost advantage over traditional units, opening up new markets for stationary storage. The site host shares the savings in energy cost with GCN, so there's little or no upfront cost for installing such a unit. 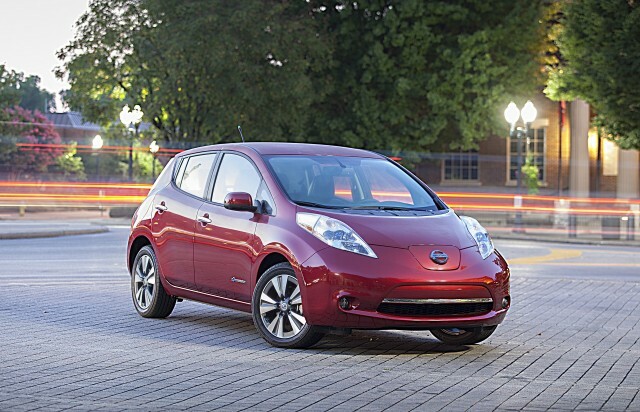 Nissan will provide used packs from its electric cars--it has presently delivered more than 178,000 Leafs since December 2010. It said the two companies' engineering teams worked together for more than a year to develop the storage unit. The first such unit, Nissan says, will be installed at a Nissan facility this summer. It will be configured to provide electricity during periods of peak demand, not only saving the company money but helping the stability of the electric grid. 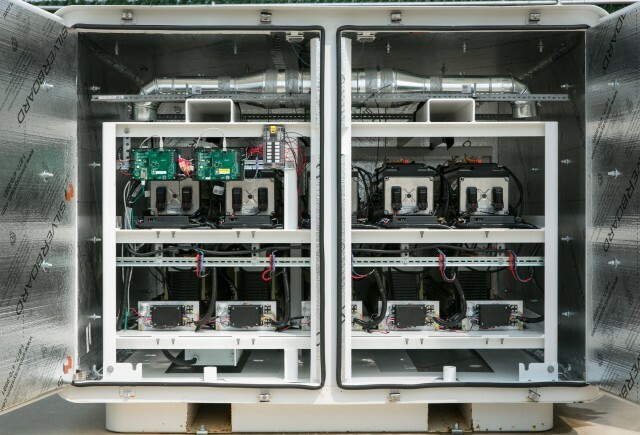 Nisan has experimented with second-life uses for batteries in the U.S., Europe, and Japan through the joint venture it formed in 2010 with Sumitomo, known as 4R Energy.